The set of three Sink Mats in various sizes is just right for protecting shelves, countertops and vanities. Create a handy landing pad for the next wet mess in your kitchen or bathroom before it ever happens! These highly absorbent microfiber-and foam mats are perfect near sinks and faucets, where drippy, sticky, gooey messes are most likely to occur. A layer of soft Norwex Microfiber tops a thin layer of foam to absorb drips and spills from wet glasses, bottles and jars. The textured bottom layer features silicone dots to reduce slippage. Large: 25.4 cm x 20.3 cm / 10" x 8" Medium: 20.3 cm x 15.2 cm / 8" x 6" Small: 15.2 cm x 10.2 cm / 6" x 4"
Countertops near sinks and faucets, along with laundry room shelves, are notorious for the wet, drippy jars, glasses and bottles that always seem to make their way there, often leaving a sticky mess. Wouldn’t it be nice to keep your countertops spotless and shelves free from sticky, drippy, gooey messes? The set of three Sink Mats in various sizes is just right for protecting shelves, countertops and vanities. • Microfiber-and-foam mats quickly absorb drips and spills to help keep surfaces clean. • Unique textured backing helps prevent slipping. growth within the cloth within 24 hours so that it is ready to use again. • Neutral graphite and taupe color combination complements any décor. 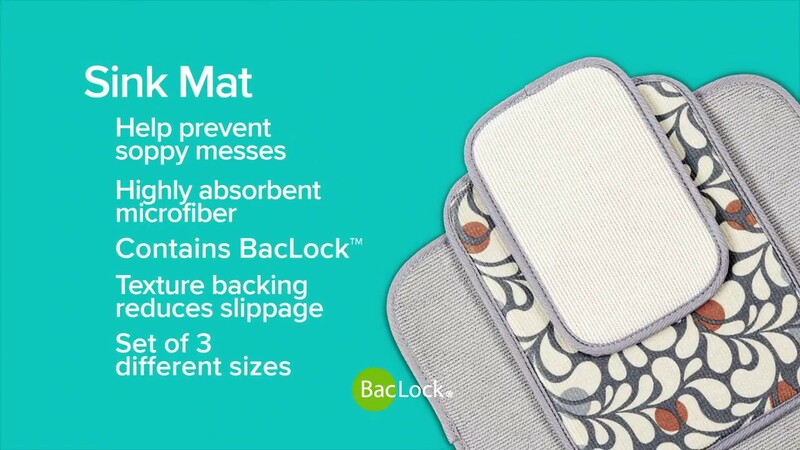 • Set includes a small, medium and large mat, so there’s a size for every space. and grime. Keep a Sink Mat nearby and remind your family members to think of it as a “landing pad for the mess”! • Slightly dirty mats can be washed with Norwex Dishwashing Liquid under warm running water and used again before laundering. Rinse thoroughly after washing and always hang to dry. • Heavily used mats should be laundered using a Norwex laundry detergent, which contains no fillers. • Do not use bleach or fabric softeners.